There is long-standing battle over which of the editions is actually the true first edition. This is a continuing question and we have not yet seen someone with strong proof one way or another. The book was published in 1895. There are those who feel that the Neely's Prismatic Library was the first edition (Salamander) and others who feel that the similar edition with the butterfly on the back is the actual first edition. What is probably the most compelling evidence for which is which is the change in text between the two versions. This text change makes the Salamander version stand alone from the Butterfly version despite the fact that the Butterfly version has thicker, better paper and the feel of a cut paper edition. Actually, there is a large question about the two versions. There are two printings of the book, both claiming 1895 first edition status. Both are printed by the same company but one, the green "The Neely's Prismatic Library" version with the salamander on the cover is believed to be the original. The Salamander cover version of the short story The Yellow Sign contains the lines: "Then, as I fell, I heard Tessie's soft cry and her spirit fled to God, and even while falling I longed to follow her, for I knew that the King in Yellow had opened his tattered mantle and there was only Christ to cry to now." 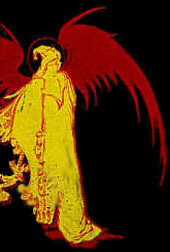 The Butterfly cover version (and all subsequent versions) change the lines to: "Then, as I fell, I heard Tessie's soft cry and her spirit fled, and even while falling I longed to follow her, for I knew that the King in Yellow had opened his tattered mantle and there was only God to cry to now." Despite the newer versions, we have opted to print the Salamander cover version, since it appears to be the author's original words. It was perhaps, at the time, an editor's fear that the book might be perceived as heretically anti-Christian. Therefore the subsequent versions have dropped the reference to Tessie's soul fleeing to "God" and replaced "Christ" with the less specific "God." The butterfly version is the one you seem to have. If you come across the version with the King in Yellow depicted with wings on the cover you will see that it agrees with the butterfly version. ... 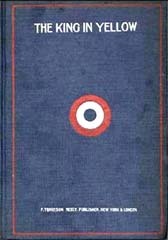 I have not personally checked the version with the bull's eye (French rondel) or the Memorial version from the 1930's. But I suspect that they also present the butterfly version. In our version we are attempting to fulfill the original author's wording. We have put up a notice in the text which refers to this page and the discussion of which wording is correct. Anyway, that is why we have the current version on the electronic site. Thanks for bringing this up. Let us know which version the book you have (mainly by cover, if there is an tipped in photo of the author, and if there is advertising tipped into the back). We intend to put an article on this on line shortly to continue the debate. I have the dark blue "bullseye" cover of KIY (with author photo in front and advertising in back), so I can contribute two very tiny pieces of information about it. "The Yellow Sign" contains the "only God to cry to now" wording rather than the "Christ" wording, and the final sentence ends abruptly. So the bullseye wording matches your description of the butterfly wording. If genuine, it puts an upper bound on the bullseye publication date. There appears to be a matching edition of "In the Quarter" and "The King in Yellow" with the same bullseye on the cover. The bullseye is actually the "French Rondel," a military symbol developed from the French flag and used to mark military planes and vehicles to signify the origin country. It appears that among the many reprints of RWC's work, the first two books were reprinted as a set. The French symbol is appropriate since both have French settings. This was also done later with RWC's historical and society novels. What we don't know is the date of this matched set. HRC cops.1-6: Advertisements: (2) p. at end. HRC cops.1-6: bound in green cloth; stamped in brown. Cops.1-3,5: have monogrammed stamp in brown on front cover and a frontispiece. Cops.4-6,8: have variant stamp in brown on front cover and no frontispiece. HRC cop.1: (CUR) HRC bookplate: The L.W. Currey Science Fiction and Fantasy Collection. Cop.2: UT bookplate: The Henry and Mollie Cohen Library; inscribed to Dr. H. Cohen from Lallah R. Block, June 30, '97. 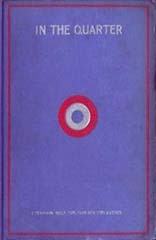 Cop.3: Presentation copy of the publisher, 12th August 1895; signed by the author. Cop.6: (GRO) Ex libris John Stuart Groves; bookplate on front pastedown (tipped in by HRC); armorial bookplate of the author with his signature (tipped in by HRC). Cop. 7-8: (MCU) Ex libris George Barr McCutcheon. Cop.7: rebound in brown morocco. Cop.8: Author's ALS to George Barr McCutcheon, dated March 19, 1916 (tipped in); in dark green slipcase; Reg. no.1464. I am certain that there are interested parties who will prove either theory and, hopefully, someone who has the final and definitive answer. And it would be interesting to know if the change came from the author or the editor. Perhaps someone will find a criticism of the book and the reference to "Christ" which caused the editorial decision to change the work between the first and escond editions. It certainly would knock the bookselling world on their ear if someone were to prove the traditional thinking wrong. If anyone has more information on this subject, please feel free to contact us at RWChambers@miskatonicuniversitypress.com.